All salads come with your choice of dressing: Ranch, French, Creamy Italian, Thousand Island, Honey Mustard, Greek Vinaigrette, Oil & Vinegar, Bleu Cheese, House Dill, Fat Free Ranch, French or Italian. 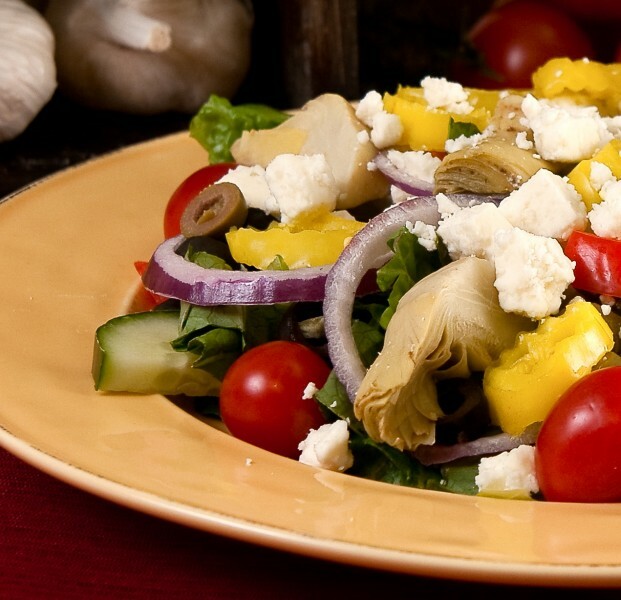 Leafy romaine, cherry tomatoes, red onions, black & green olives, cucumber, red & green peppers, banana peppers, artichokes, feta cheese & vinaigrette dressing. Served with hot garlic bread. Fresh mix of iceberg, romaine & spinach topped with potato sticks, cheddar cheese,tomatoes, crisp bacon & eggs. Grilled chicken breast on a bed of fresh romaine, iceberg & spinach topped with cheddar cheese, tomatoes, potato sticks, crisp bacon & eggs. Served with hot garlic bread. Fresh mix of iceberg, romaine & spinach topped with ham, pepperoni, green peppers, mushrooms, red onions, black olives, mozzarella, cheddar cheese & tomatoes. Served with hot garlic bread. Crisp greens, chopped ham & turkey, eggs, cheese, red onions & cherry tomatoes. Served with hot garlic bread.